What is the differences between the ARRIS X220 (CA0128) and the X220 V2(CA0157)? 2. The camera upgrade from ARRIS XAT700M camera to FOXEER ARROW Mini Pro camera. 5. Antenna is upgrading to the Foxeer Pagoda pro mini antenna. 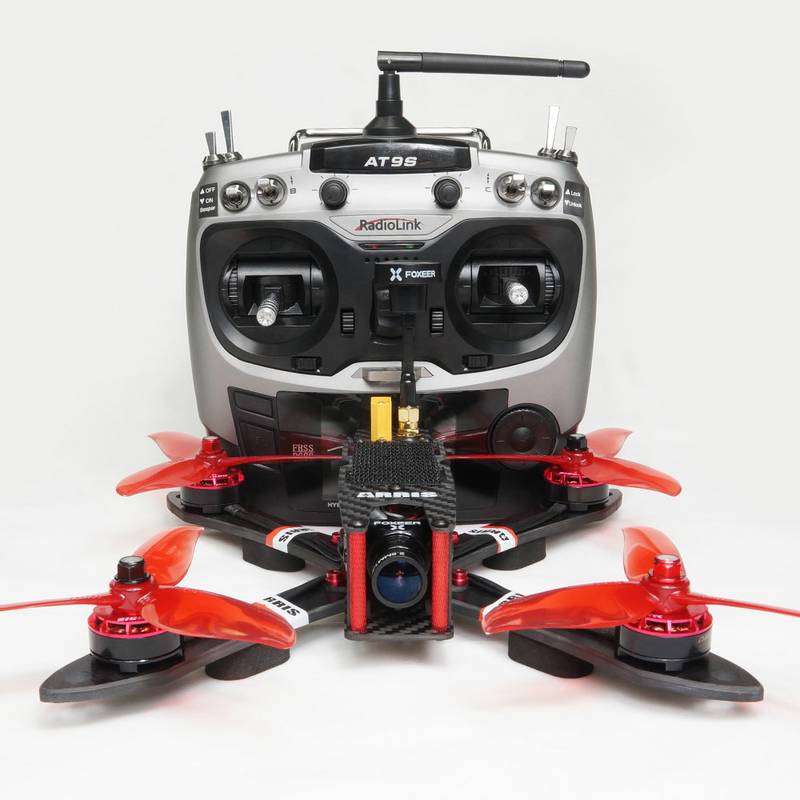 ARRIS X220 220mm FPV racig drone RTF is fully assemble and tuned, it is ready to fly. It is one of the best racing quad for freestyling. ARRIS X220 RTF comes with ARRIS X2205 2300kv high quality brushless motor,Flycolor Raptor S-Tower BHeli-S 2-4S 4-in-1 30A ESC + F4 + PDB + OSD board,Dalprop T5045C high efficiency propeller,Foxeer ARROW Mini pro fpv camera,5.8G 48CH long range mini video TX,Radiolink AT9S with R6DSM mini receiver and 4S 1500mah 50C lipo battery. Before leaving the factory, the RTF is tuned and tested by the technician. The main feature of the ARRIS X220 is the "X" symmetrical design,light weight,simple structure,durable and agile.The ARRIS X220 comes with the chamfered edge design on the arm, which gives the quad a sleek look.It comes with 4mm pure carbon fiber plate arm, make the frame super strong.The ARRIS X220 is made of pure carbon fiber with alloy pats, the weight is quite light.The structure of the X220 is simple, it is easy to maintain. ARRIS X2205 V2 2300KV brsushless motor�is high end brushless motor specially designed for high performance fpv racing drones.It adopts brand new M5 steel shaft, improving the structure strength. It had been upgraded to centrifugal fan design, optimizing the heat dissipation.It also adopts original Japan NSK bearing and N52 tile-shape magnets to ensure the power and quality of the motor. The propeller is made of imported PC,the strength is high, and the root is thickened,which make the propeller is not easily broken.�The smooth surface design on the prop decreased the windage resistance,increasing the efficiency of the propeller. The Foxeer Arrow ARROW Mini Pro Camera comes with excellent WDR, which works well in the fast change of the dark and bright environment, support 5-35V super wide voltage, and built-in microphone and FPV OSD.The angle of the camera is adjustable on the ARRIS X220. ARRIS VT5804 48CH 0mw/25mw/100mw/200mw/400mw/600mw Switchable Video Transmitter.It has stable output power, long transmission range (0.5KM+@25mW; 1KM@200mW; 2KM+@600mW with stock antenna), 6 power switchable,Output power and frequency setting can be done in OSD interface through remote controller and it weighs only 6g, perfect for fpv racing quads. Foxeer Pagoda Pro 5.8G mini antenna.�The body adopts imported PC+ABS material, can withstand high strenghth impact. Double-jacket semi-rigid cable for heavy impact resistance. Lower feeder loss, easy to install, can be bent at any angle and maintain. There are three flight mode on the radio: Attitude Mode (Self-level mode), Acro Mode(Manual Mode) and Air Mode.